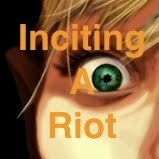 Episode 64 of Inciting A Riot: the Podcast finds us Inciting A Magical Riot! While we’re not defining magic today, we’re broadening our thinking about what magic is. There is math involved. Also, quick note, I mentioned there would be poetry, and there is no poetry. I got to the end of the show and completely forgot. Don’t worry! It’ll show up in Episode 65! News: Sasha Grey likes to read, Sorority girls like the Cosby Show, Obama doesn’t thank God, and Siri is pro-life. Please continue to vote for the show on Podcast Alley. Vote, subscribe to, and rate the show on iTunes. Join the TwitterRiot by following me @IncitingARiot. Enter the Swag Contest through a donation on PayPal or purchase of swag through the CafePress.com swag shop. Check out my art on FireLyte.Etsy.com. Send any and all feedback to IncitingARiotPodcast@gmail.com! I would be the tree-hugging, left-wing, homosexual, dirt-worshipping poet your conservative parents warned you about. (c) Fire Lyte - Inciting A Riot. Simple theme. Powered by Blogger.